Clone naval officers also known as clone navigators were clone troopers specifically trained in technical and tactical aspects of naval command. Kaminoan scientists speculated that clones’ aptitude for space combat came from Jango Fett’s understanding of dogfight tactics, but even amongst his clones some had proved themselves capable of understanding and executing naval strategy to a greater degree than their brothers. 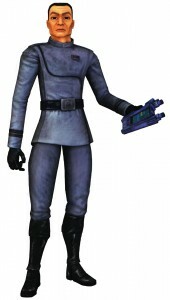 Those clones received special naval training and many of them eventually became officers in the Republic Navy, although most of them were lower-tier commanders and aides to superior non-clone officers. Some of those officers believed that despite their training the clones were not suited for a role of an officer, which sometimes led to rising tensions aboard Galactic Republic ships. Although Grand Army of the Republic soldiers such as Rom Mohc had a high opinion of clones and relished working with them, others decided to avoid following Mohc’s kindness. As a result, these naval officers had tense relationships with officers.